This is Jenni's little boy Dex and his BOY version chair. 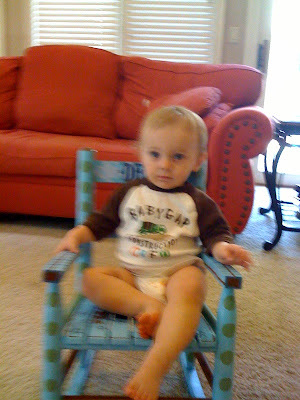 It's a little fuzzy but the boy and the chair are as cute as can be! I'm from Tulsa... great place. Abby's has gotten so many nice gifts. The internet is wonderful when it brings you together with kind people. That would be perfect for my little girl. If she ever sat down...ha! Oh Kelly! 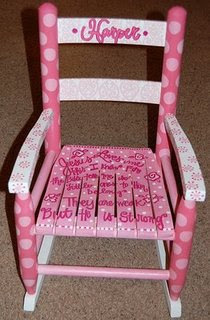 I have been reading your blog ever since I painted the rocking chair for Jenni to give to you! I was so impressed at her generosity and had to check out this blog. It has become the only blog I read and I read it every day! So fun to see the chair on here! You are such a wonderful influence on others! Thank You! I LOVE painted furniture like this. The polka dots and the song lyrics are adorable! I'm sure Harper loves her own little chair! Super cute! I love that the boy version is all little boy just like the little girl version is all dreamy princessy. Sometimes you see little boy stuff that's not masculine enough...but this chairola is super cute both ways! My Benjamin has a red rocking chair that used to be mine as a kid. The babes look so precious in them! I love all the polka dots and the "Jesus Loves Me" lyrics - so adorable! What a keepsake! Awe, that chair is super cute! That chair is just the cutest thing ever. I bet that Harper will get tons of use out of it too. I have a red one that was mine as a child that oldest uses and so will London, our baby. Oh my, I do have a lot of "this is the best" I love her big bows,Have you started a Harper wall yet with all her best pictures in frames? I really love that chair!! So cute! That chair is just adorable! So is that lil girl of yours :-)It will be wonderful for her to hang on to that and keep passing it down! So...the chair is cute but I am dying to know where Harpers outfit is from. My little girl Kennedy is having her second birthday party this weekend and it is Turtle Themed. I have a cute little Gymboree Turtle Dress for her but her invites were pink and green so that little outfit Harper has on would be even more perfect. If you can, let me know. Thanks so much! What a wonderful friend to give Harper such a keepsake. 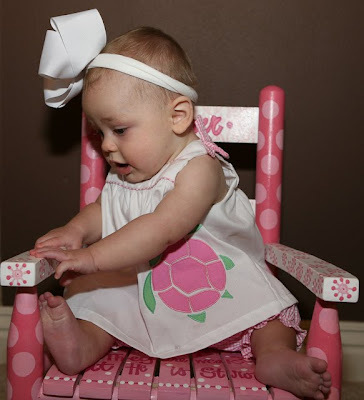 She is adorable sitting in her rocking chair and her children will be too. I'm sure Harper has a pair already, but I HAD to link you to this site! Love her chair too btw! Know that I'm always here praying! I LOVE that chair! I wish I had known about them when my daughter was born. Now I'm thinking about everyone who is pregnant for the perfect gift. That chair is so darn cute! I love it! Such a cute chair! I'm expecting a little girl in December and now I want one! I think I could make it out of a chair that was once mine!Anyway, I just wanted to say I love your blog! I'm going to add it to my blogroll right now in fact! :)Have a good one! What a precious chair and what a treasure to keep. Oh that is seriously cute! Love that chair. How sweet is that chair! I love it!!! Thanks for posting on the chair... Since I had seen it I have wanted one when I redo Kelcee's nursery into a toddler room... Pink and Leopard... I am gonna order one of those chairs in pink and brown... Thanks so much for the info... Now on the shipping I betcha that's a fortune... Huh... Ha! Ha! So glad you shared this! It is adorable!!!! I'm from Oklahoma City, but was in Tulsa last weekend...hmm...might have to check out that website for my friend's baby due in January. Too sweet! these chairs are to die for!!! Thanks for sharing! That chair is so cute! I'm visiting you from The DIY Showoff. Nice to meet you! If you get a chance, please stop by to see me. I've tagged you with the attitude for gratitude award. Adorable chair. And LOVE her name. That chair is too cute!! !